Aurora Borealis glows directly overhead in the sky above Kenai, Alaska. Away from the light steals home my heavy son." 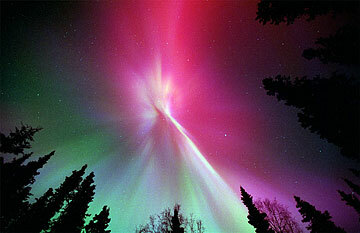 ON DEC. 16, 2006 the northern sky blazed with floating curtains of red and green light. This event was unusual because it was seen as far south as Arizona. The northern lights, or Aurora Borealis, are common in the sky for viewers at north polar latitudes. The name, like many scientific names comes from Latin and Greek. Aurora was the ancient Roman goddess of the dawn, and the ancient Greek name for the north wind is "Boreas". The corresponding occurrence, in the southern polar skies are the Aurora Australis (Southern Lights). The Dec. 16 light show was caused by a coronal mass ejection (CME) from the sun on Dec. 13, causing a severe geomagnetic storm. Such storms are not uncommon. The sun spits out hot electromagnetic plasma from sunspots all of the time, and they vary in intensity like burps from within the blazing interior of the sun's nuclear furnace. But most CMEs are not aimed at Earth, so the vast majority of them miss us. The plasma from a CME creates the aurora by doing the same thing naturally to Earth's atmosphere that we do artificially in glass tubes filled with neon and other gases to produce colored signs and television pictures. When atoms and molecules of gas at low pressures are energized by electrically charged particles, they absorb certain specific amounts of energy that correspond to transitions of electrons to higher energy levels within the atoms. A quantum of energy is proportional to a wavelength of electromagnetic radiation. If that quantum is in the appropriate range we call it light, and we perceive different energy quanta or wavelengths as different colors. Each atom and molecule has a unique electron configuration, so every gaseous substance has a unique set of specific wavelengths that it absorbs like a unique spectral barcode. Eventually the energized electrons fall back to a lower state, emitting light with exactly the same barcode of wavelengths that it absorbed. We see the emitted light as colors that are a mixture of the various wavelengths. For example, neon gas emits almost entirely wavelengths of red light, so it is used in red signs. To make a neon sign, a glass tube containing neon gas at extremely low pressure has metallic caps with electrodes attached to the glass to form an airtight seal. When the tube is energized by electricity, electrons stream through it causing, the neon atoms to jump up and down between energy levels and emit light. Although we call all such glowing tubes "neon" lights, the different colored lights are mixtures of various gases designed to produce the desired colors. This is the same effect that illuminates the tiny pixels of plasma TVs. The plasma TV screen is made of microscopic plasma tubes that emit red, green or blue light. The colors combine the same as the red, green and blue phosphors on a CRT television screen, or the red, green and blue LEDs on an LED screen. Another factor that made the Dec. 16 auroral display so unusual is that the sun is in the calm phase of its eleven-year sunspot activity cycle. It reached the peak in April 2000 and is expected to be in the minimum phase of the cycle this year. It is not only during CMEs that the sun emits plasma particles. They continuously emanate in all directions at very high speeds -- an average of almost 1 million mph! They pervade the solar system and are known as the solar wind. They push the tails of comets away from the sun, among other things. The relatively steady solar wind, which contains fewer than one particle per cubic inch when it reaches Earth, is deflected by the planet's magnetic field to form a magnetic shock wave around it called the magnetosphere. The solar wind flows around the magnetosphere like water in a stream flows around a rock. It also distorts it so that instead of a symmetric set of magnetic field lines like those around a bar magnet, the magnetosphere is stretched and elongated into a raindrop shape with a long tail trailing away from Earth on the side away from the sun. At the boundary of the magnetosphere (called the magnetopause) the earth's magnetic field is in equilibrium with the solar wind. A CME creates a raging flash flood in the solar wind that distorts the magnetopause, causing a surge of plasma particles to be accelerated into the magnetosphere. The accelerated ions travel along Earth's magnetic field lines, constrained like beads on a wire. The magnetic field line converge toward the north and south magnetic poles where they are nearly perpendicular to the surface. Ions traveling along the field lines collide with atoms and molecules of the thin upper atmosphere and produce light just as the electrons in man-made plasma tubes. The particular colors we see in an auroral display depend on the kind of gas molecule struck by energetic ions, and the energy level to which the molecule is excited. The two main atmospheric gases in the upper atmosphere are oxygen and nitrogen, in roughly the same proportions as at the surface. Oxygen emits green and less frequently deep red light. Nitrogen is responsible for blue or purplish-red light that produces the purple-tinged lower borders and rippling edges of the aurora. From Earth the aurora appears as colorful curtains and rays of light that dance across the sky, but from space they appear as symmetric ovals centered on the northern and southern magnetic poles and extending outward toward the equator, gradually diminishing in intensity. Since the northern magnetic pole lies in northeastern Canada, to the south of the northern geographic pole, North America gets more southerly auroral light shows than Northern Europe or Asia. We won't see the aurora as far south as Hawaii, but their shows have enchanted visitors as well as residents of higher latitudes from prehistoric times. It is a rare and real treat to see it from mid-latitude locations, and residents of much of the United States had their New Year's light show in the sky two weeks early.